East Jakarta Industry and Energy Sub-dept. 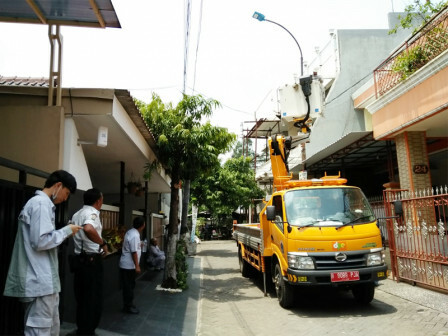 is replacing 103 streetlights in a residential, RW 10, Pondok Kopi Urban Village, Duren Sawit. They will replace lamps type HPS with smart system lamps (SS).
" We'll install 103 LED lamps. They will replace all lamps type HPS that has higher power"
Maryono, Section Head of Supervision and Handling for East Jakarta Industry and Energy Sub-dept. said that LED lamp installation is a program of Jakarta Provincial Government, from 250 watt HPS to SS 90 watt LED. "We'll install 103 LED lamps. They will replace all lamps type HPS that has higher power," he stated, Wednesday (9/5). He assessed that all lamps are installed on a nine-meter-high pole that prepared by the developer. Its installation has been carried out since Tuesday (9/4) and is targeted to be completed today. "Lamp installation uses a ladder car as high as 14 meters with five officers," he stated.